Looking for the perfect card to show you care? Over the coming year, we'll roll out a series of greeting cards for birthdays, anniversaries and other special occasions. Bookmark this page now so that you'll be ready for Valentine's Day in February. 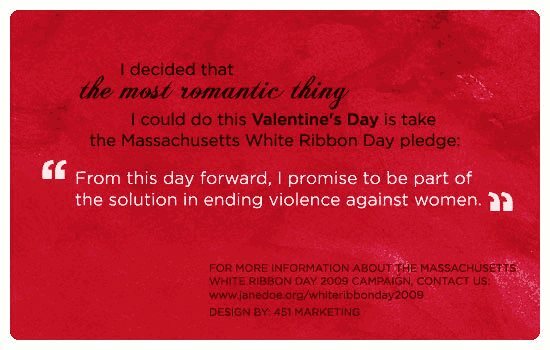 We have prepared special White Ribbon Day Valentine’s Cards to share with your friends, family and loved ones. We've also made the cards available to be easily printed or emailed as a four-panel card, individual cards or an animated card. 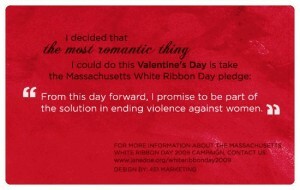 Here are animated cards you can download to send to a friend by email. Right Click and "Save Link As", or "Save Target As", then attach the file to your email. Here are single panels you can download to include in an email to a friend. Right Click and "Save Link As", or "Save Target As", then insert or attach the file to your email.